This is my review of Cloudron in written form, but if you’d rather hear about it, I recorded a podcast episode featuring Cloudron and one of its founders Johannes Zellner. I’ve written about quite a few great applications on here, and most of the time, the installation process was the most tasking part of setting them up. I sometimes wondered what it would be like to be able to just click an icon and have these applications installed on my server, without having to go through the trouble of figuring out the installation documents. Turns out, I wasn’t the only one. Cue Cloudron: a platform which, once installed, allows you to install applications from their app store by clicking an icon, naming a subdomain and you’re good to go. Cloudron is a platform which could transform the way we self-host. After an easy installation process, it allows you to install a number of great apps – most of them open-source – by doing not much more than clicking an icon. It has just reached version 1.0 and is now ready for primetime. Installation is as easy as possible and while you’ll need to pay for all its features, they have a basic free version as well (more about that at the end of this review). Cloudron provides a shell-script which you can upload to your own server and which, after assigning a domain-name to your server, installs a platform which lets you install new applications on your server with ease. Once you’ve set it up, your admin panel can be found at my.yourdomain.com. This is where you install apps, change settings or look into usage statistics. When wanting to install an app, you go into the App Store, which is conveniently sectioned into the various types of software. From feed-readers to project management and simple blogs – Cloudron offers a cornucopia of various tools. 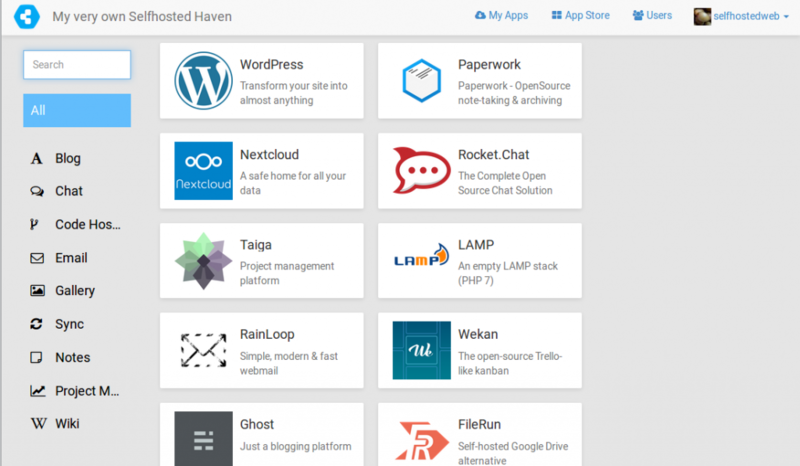 If you know of a tool you’d like to use, but you can’t find it there, fear not: while the good people at Cloudron have a bit of a backlog of apps they want to add, you can suggest new apps to add right here. Or even better, if you’re a developer, you can easily get involved and pack whatever open-source app you wanna see there for deployment on Cloudron. Apart from providing all these apps to install with one click, Cloudron also does all the heavy lifting when it comes to the nitty gritty you wouldn’t usually want to occupy yourself with. 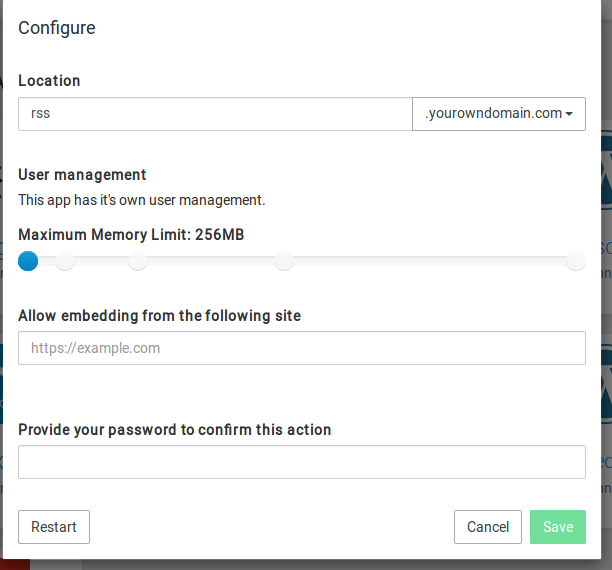 One of which is setting up subdomains or connecting one app with an external URL, all of which you can do from within Cloudron. When you set up your Cloudron, and if the service where you’re hosting your domain is supported, you enter an API-key and Cloudron handles all the DNS stuff (unless you’re using an external URL, in which case you’ll simply have to point it to the ip-address of the server you’re hosting Cloudron on). Also: all apps automatically run via SSL, so all the connections to your apps are encrypted. With the advent of free Let’s Encrypt, that has already been made much easier, but Cloudron goes a step further and takes that out of your hands too. They set up all the certificates and take care of their renewal. Finally, Cloudron also provides something which is quite invaluable today: a pre-configured, or at least very easily configurable e-mail box for your domain. If you’ve tried to set up your own e-mail server, you’ll have soon realized that it is a bit of a pain. Cloudron does all the configurations for you and if you install one of the mail-apps available via the store, it will already be configured to use your domain and username. Cloudron, on purpose, is being kept very simple. There’s not a whole lot of different values for you to change, but you can alter one of the most important ones: memory allocation. Cloudron is very permissive when it comes to the amount of apps you can install on your server (meaning: as many as you want), but once you’ve got a few running, they’ll give you a warning that your server might be running low on resources if you do that. And some apps just need more memory than others. So what you can do is go into each app’s own configuration window and set how much memory you want to allocate to it. This, of course, depends on the app, as some need a ton of memory and others will be quite happy with the standard set amount of 256MB. Generally, make sure you don’t bog down your server with too many apps and if you feel that an app could run a bit more smoothly, go ahead and tweak those memory settings. And while Cloudron can be used by just one person alone, it is also perfect for larger organizations. Its user-management makes sure that whenever possible, you won’t have to set up separate users within the apps you’ve installed, but you can instead just make those apps use the credentials for the Cloudron install. This makes managing a larger group of users quite comfortable. If you’re the type of person that’s more comfortable doing everything in the command-line, you’re in luck. Cloudron offers a CLI-tool, which lets you not only perform all the functions of the graphical user interface, like starting, stopping or restarting an app, but also connect to an app directly to do maintenance or to package your very own Cloudron apps. They’ve written blog-posts about how to use it, the first one of which you’ll find here. Considering you’re installing software with such a scope, the installation is as easy as they come. All you’ll have to do is paste three commands into your command-line and everything else can be done via the browser. Future updates to the platform and the apps will be automatic (unless you’re on the free plan, but more about that below). Oh, and if you’d love to use Cloudron, but you don’t even want to deal with finding a server and setting up Cloudron yourself, you can let Cloudron manage your server for you as well (more about that below as well). 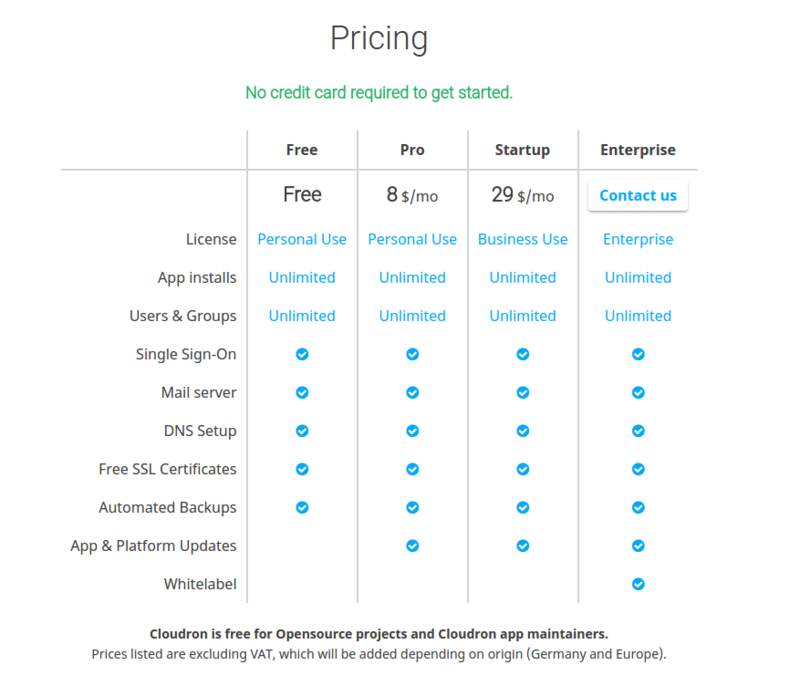 With Version 1.0, Cloudron is now a freemium product. They have four different tiers and because I’m a deeply lazy person, here’s a screenshot of their pricing (for future visitors, this was in June 2017, so you should go here to see whether that’s changed). As you can see, the free version includes almost everything else, apart from the automated backups. I, personally, would very much recommend going for the Pro tier, simply because having automated updates is what makes this whole thing really shine. Also, the good people at Cloudron have worked hard on this for the last two years and I think it’s a great way to support what they’re doing (it’ll also increase the chances that Cloudron will be here for a long time to come). If you’d rather let them manage your server, they have separate plans for that as well. Find them here. 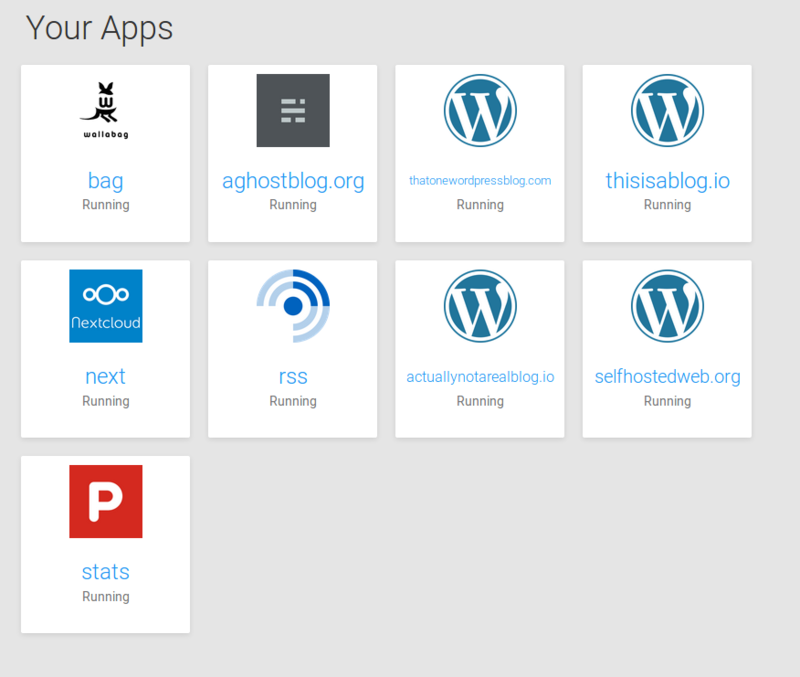 To summarize, I think Cloudron is probably the most exciting one-stop-shop solution if you want to jump into self-hosting. It’s easy to set up and considering the amount of time and work it will save you, very competitively priced. Finally, for everyone who’s made it this far: if you choose a paid plan until July 7th, you will get 25% off the Pro and Startup plans. To get it, just install Cloudron and when setting it up, you’ll be asked to choose a plan.